Elizabeth Vander Kaden, 93, passed away Tuesday, August 1, 2006 in Knoxville, at Shannondale Health Care Center. Elizabeth was a former resident of Appalachian Christian Village. She was born in Schiedam, the Netherlands and was the widow of Willem Vander Kaden. Elizabeth and her husband were active in the underground during the Second World War when the Nazi occupied and oppressed the country. They sheltered a Jewish toddler who was given in their care when the child?s parents were deported to the death camp at Auschwitz. Elizabeth took a great deal of personal risk when she and her husband decided to protect the little girl they named Sonja. People caught helping the Jews often met the same fate. After the war it became evident that the child?s parents, grandparents, aunts and uncles were killed in concentration camps. She and her husband then became her foster parents. Her name will be added to the list of Righteous Gentiles, a memorial at the Holocaust museum Yad Vashem in Israel. In 1952 Elizabeth, her husband and Sonja started a new life in the United States. The three settled in New Jersey where she took a position in the local high school cafeteria. She subsequently learned to speak English and obtained her dietician?s license. Several years later she became a school crossing guard with the Park Ridge, NJ school system. In the early seventies she and her husband moved to Tennessee where their daughter and family settled. 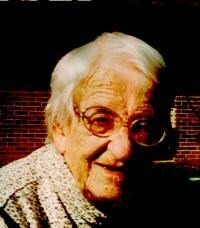 She lived in the Appalachian Christian Village until 2002 when she became a resident at Marshall Voss Health Care Center in Rockwood, TN. She is survived by her sister, Gertruida Den Held as well as nieces and nephews in the Netherlands; her daughter and son-in-law Sonja and Ron DuBois of Knoxville; granddaughter, Monique DuBois and Elise Chapman of Shiloh, Georgia. She leaves five great-grandchildren and her nephew John Vander Kaden in Canada. She was a member of the First Presbyterian Church in Johnson City. In lieu of flowers: donations may be made to: Yad Vashem, The Holocaust Remembrance Authority, P.O.Box 3477, Jerusalem 91034. A graveside service is scheduled for Monday, August 7, 2006 in the Monte Vista Memorial Park, under the direction of Pastor Don Muncie. A visitation will immediately follow the service at the church, 105 S. Boone St., Johnson City. Dear Shifra-Sonja-Clara, as I was able to visit with you and family week while in Knoxville for the service and since, I have found myself thinking particularly of Matthew 6:14b, “deliver us from evil” and Matthew 18:2-5, “And calling to him a child … Whoever receives one such child in my name receives me”, and from Torah, Devarim (Deuteronomay) 5:10, “showing steadfast love to thousands of those who love me and keep my commandments”, even those without child of own flesh, and sovereignty and providence in mercy from generation to generation on those who fear the Holy One of Israel, scatterer of proud, demoter of mighty, filling hungry with good things. My own words fail. Surely that One has honored me and my house well beyond any deserving in allowing us to listen in on the story of your own. As I may have told you after the service, and have told several others since, I found myself thinking utter astonishment and awe at the hillside that such small box and small hill could hold such, even unassuming of whom none would ever guess apart from the hearing, giant of grace. Certainly in her life she herself honored her fathers and mothers of both flesh and faith (Devarim 10:16), and Hashem of that grace even through peril truly gave her long days in the land he gives us all, and from and in them and their number, and even our own, to find share of comfort, l’alam ul’almei almaya.